At Clocks247.com, we believe that being stylish is one thing and adding a style element to your home is another. For the latter, we have a wide range of modern clocks for you to choose from. Let our range become the reason for your neighbor’s envy. Bring home one of our clocks and who knows, your home may be dubbed the most stylish abode in the area. 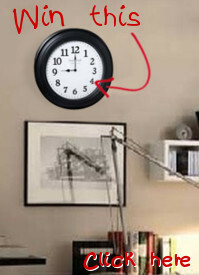 Why invest in such clocks? • The times they are a changing, and so are clocks. So, it makes no sense to stick to the age-old designs. Be modern, buy modern! • Unless you have a thing about traditionalism, chances are that your home boasts of a modern décor. Don’t spoil the look, we would say! • One look at these clocks and your guests know that you are the one they can talk to, if they ever need any style tips to decorate their home. Create a lasting impression, one that never fades! These days, when every other site claims to offer modern clocks, you got to play smart, and we give you that chance. Our site features detailed information about each of the clocks, and then, you also get to see full size pictures. So, there is absolutely no room for doubt. Furthermore, while others charge you exorbitantly assuming you’d spend anything to ‘modernize’ your home, we have always kept the prices low. If style and cost-effectiveness can go hand in hand, you won’t go elsewhere, right? More importantly, we have different types of designs and therefore despite varied likes and dislikes, customers easily find the most suitable design for their living room. Why now’s the right time? The good news is that we have slashed our prices even further and therefore you can find several options that are going to cost you up to 30% less than before. You should buy things when they are in vogue, not when no one else is getting them. Not that these clocks would ever go out of fashion, but don’t take chances! Why you should have our contact details? You may have some queries or might need some details or additional product information; whatever the reason is, just keep our number handy (1-855-242-0514). If you are looking for a detailed response, write to us at sales@clocks247.com.